Having ME/CFS is a joke – problem is, it’s not funny. 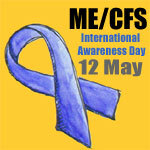 ME.CFS is exhausting, on top of that we just cannot get through to people. I am sick and tired of trying to explain day in day out. I am able to commute and go to work, i manage the house, the garden and my health and hygiene. I am lucky! I don;’t have a social life, I have lost most of my friends and all of my hobbies, i have lost 2 jobs. i am sick and tired of being sick and tired. I look fit and healthy, I look 10 years younger than I am, I am able to do lots of things but how do I feel – well I feel crap every morning when I open my eyes and I think, bloody hell, here i go again,. No matter how much I sleep, no matter how much care I take, I am always exhausted and sick and tired of explaing. The medical profession are not taking us seriously. i know people who are disabled, they need a hip operation, have the operation, and still keep the “disabled badge” – I am permanenty disabled, for the rest of my life and you know what – they don’;t care because it’s not them and they can’t see our suffering.